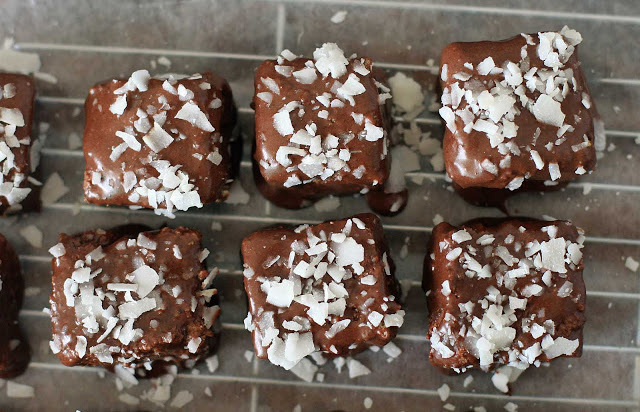 An Australian classic, Lamingtons are little cubes of sponge cake covered in chocolate frosting and shredded coconut. It’s probably an understatement to say that they’re kind of a big deal Down Under. I mean, I even saw blogs devoted solely to these cakes. Most recipes I saw called for a powdered sugar and cocoa powder based frosting. I put it head to head against my favorite chocolate ganache. It’s probably no surprise which won. And I’m by no means a frosting snob (I’ve definitely been caught eating frosting straight out of the jar many times before), but the ganache is smoother, richer and actually coated the cake better. And it’s super simple to make as well. Note: the recipe for sponge cake batter makes a bit more than a square baking pan, so use leftover batter to make some cupcakes to snack on while you’re assembling the lamingtons. The cake is delicious on its own… almost like a rich Angel Food Cake. Preheat the oven to 350 degrees. Line an 8-inch square cake pan with parchment paper and spray lightly with cooking spray and place 6 cupcake liners into a cupcake baking pan. Mix rice flour, baking powder, guar gum and salt together in a small bowl. In a large bowl beat egg whites until foamy using an electric mixer. Gradually increase speed to high and slowly add 1/4 cup of the sugar until the whites hold soft peaks. In another large bowl using clean beaters, beat the egg yolks until thick. Add the remaining sugar gradually until the mixture lightens. Add the flour mixture, the vanilla extract and the coconut extract, if using, and mix until smooth. Fold in about one-third of the egg white mixture into the egg yolk and flour mixture to lighten the batter. Gently but thoroughly fold in the remaining egg whites. Pour into the prepared cake pan and the cupcake tins. Bake until the cake springs back when touched lightly, about 20-22 minutes for the cake and about 16-18 minutes for the cupcakes. Use a small knife to cut around the sides of the cake pan to loosen the cake. Invert onto a wax or parchment paper-lined cooking rack and peel off the parchment paper. Allow to cool completely. Cut into 16 squares and let dry out for several hours, or overnight, on the counter or in the fridge. Meanwhile, prepare the chocolate ganache. Heat the heavy cream in a medium-sized bowl in the microwave until hot, but not boiling. Add the chocolate chips and let sit for several minutes. Stir until smooth. Let cool for a couple minutes. Place the coconut in a wide shallow bowl or on a plate. Take individual pieces of sponge cake and carefully drop into the chocolate ganache to coat all sides. Once coated, place on a cooling rack covered with wax paper and sprinkle with the coconut. 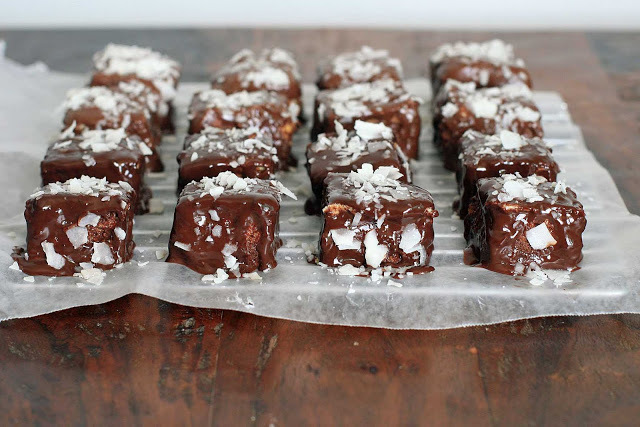 If you’d like more coconut, roll the ganache-covered cake in the coconut to coat on all sides. Repeat with all pieces of sponge cake. Use any leftover ganache to frost the cupcakes and sprinkle with coconut. Place in the refrigerator to allow the ganache to set.